These tubes are heavier and stiffer than I was expecting, but do give confidence they'll resist minor punctures. I installed these on an old Ross touring bike. The tubes fit fine and worked well for about 6 months. I went to check the tire pressure before heading out for a ride and noticed a bulge near the base of the stem on one of tires. The bulge grew in size as I tried to bring the pressure up with a hand pump. The stem failed even though I was well below the recommended tire pressure. It's the first time I have ever encountered this issue. 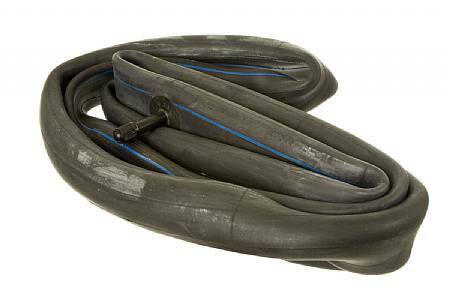 If you are a urban rider and glass, nails and bad streets are a constant nemesis, than this is the inner tube for you. I opened the 2014 season by blowing or puncturing 4 tubes in a two week span. Frustrated I ordered the Kenda Thorn Resistant Road Tubes, and bye, bye, blow outs. These tubes are bullet proof I run them on my back up bike at around 100 psi with zero issues over the same roads that drove me to tears. You give up some weight but it's worth every ounce. As the old saying goes, an ounce of prevention is worth a pound of cure. Very heavy duty . Good. Seems heavy duty, holding air good. Haven't used very much yet. Works perfect out here in Arizona among all the cati and thorns! After changing my mountain bike tubes and tires I thought I'd tackle the road bike. That turned out to be a horse of a different color and they were very difficult to get on and off. I believe I wound up pinching the tube and causing it to leak. My fault only. Read the reviews and bought two. First impression gee these things don't even need air! Installed, on a 2013 Cannondale Synapse, along with two new Gatorskins and it was like riding the ole cruiser. My normal riding speed is around 15.5 to 16.5 mph and was doing well to get 12.5mph. Top end was 17 and normally can get 22 mph! Changed out the Kenda's for the old tubes and went right back to my normal speeds, even with the Gatorskins. I used these tubes when I restored a vintage Bike could not believe the great price. A little expensive, but hopefully reduce flats when tires are thin. i bought two of these tubes back when i first got my bike, its an older bike from the 70's got it used. i splurged on these tubes along with the thorn resistant tires for the 27 wheels they also sell on this site and only now am, after a year and a half, nearly 2 years of riding constantly. (i'm talkin like 20 or more miles a day sometimes) and i mean riding, off road, off curbs, potholes, uneven roads, caliche. i wouldn't use anything else. Extra tough, so far no flats. Thought I would try to see if I could minimize punctures. Don't like the ride, makes the tire sidewall very stiff. Feels like a high inertia steel wheel with these tubes. Won't use them again - would rather have the flats. Wow! these seem very heavy duty. They are very thick rubber on the tire side and value for the money was excellent. This is heavy tube with thick bottom side. A little more difficult to install tire with this tube but not a big deal. Installed easily due to thickness, so far 520 miles with no flats. It is a heavy tube though, I weighed it at 375 grams. I'm using them for training now and will switch to a standard tube when I ride my century this year. i bought this tube because i hate flats and people in my town like to throw glass bottles in the road. i haven't gotten one yet. it is a little heavier which is a draw back if you are weight conscience. If you are a commuter on an older bike or just need a little more protection from a tube, you should buy this one. The stem broke off. I dont know the exact curcumstances as I was not riding the bike at the time, but this is the first time I have ever had this happen.